Fireplace Tile Ideas – If you are looking for the best fireplace tile ideas for your house, you’ve come to the right place. There are many types of tile that would be perfect for your fireplace. 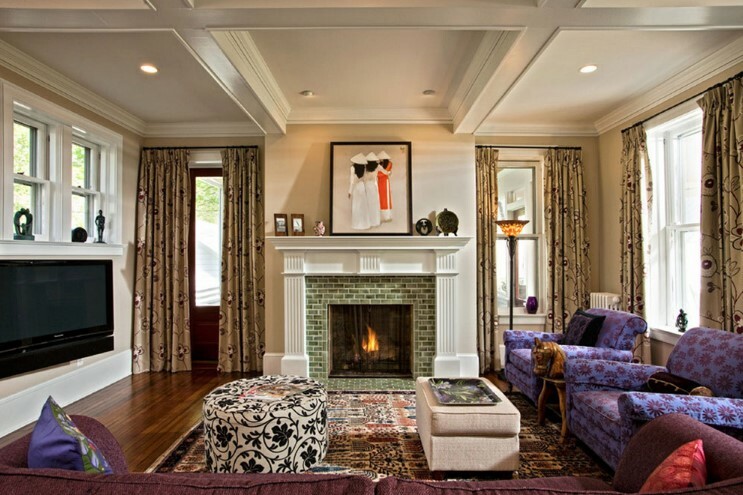 A fireplace in a house tends to be placed in the living room. 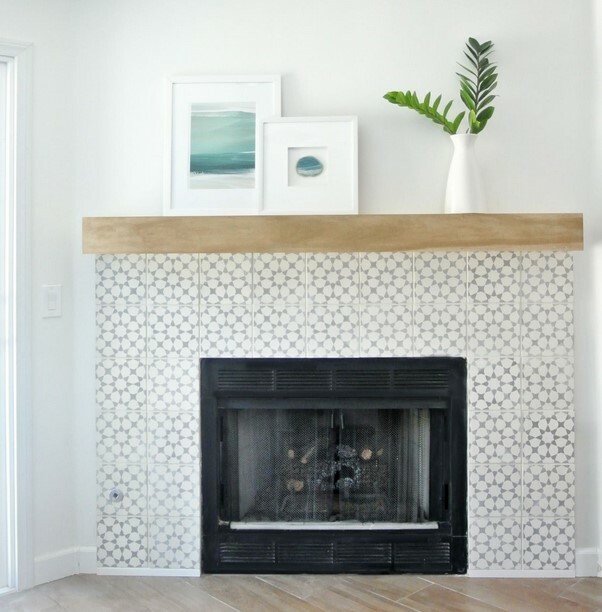 If your house already has a fireplace and you want to make it more attractive than ever, applying the right tile for your fireplace seems to be a perfect choice. 2 What Is The Best Fireplace Tile? Tile has a wide range of styles, applications, and price points available. 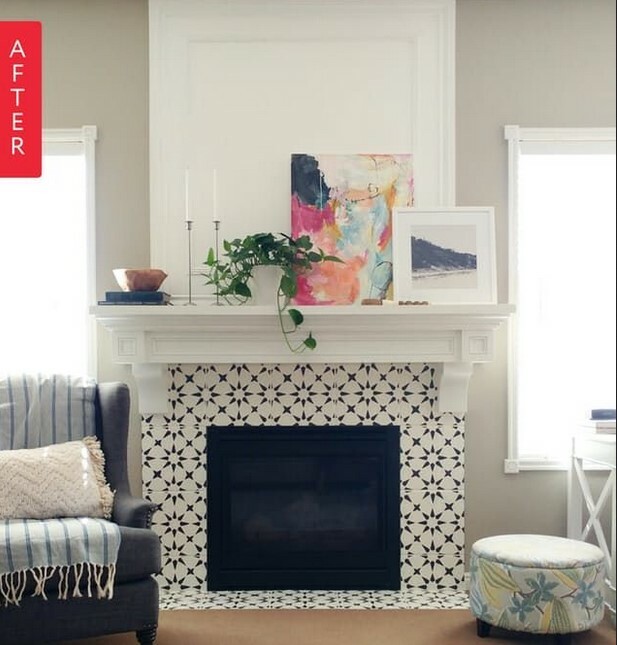 When you’re deciding to have apply tile surround your fireplace, it’s like applying a style to it. Be careful when choosing the tile design for your fireplace, because when you choose it wrong, it will break its intended look. So, you have to choose with a lot of consideration before deciding which one that fits. 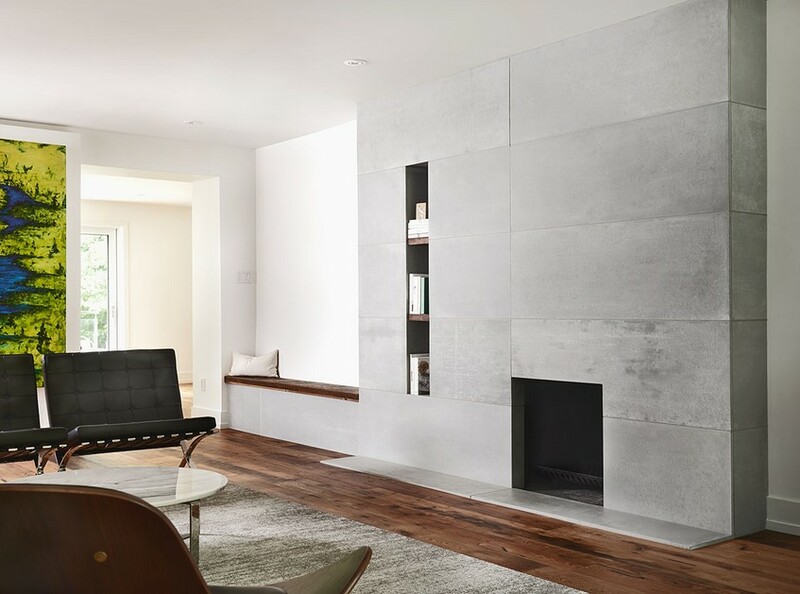 What Is The Best Fireplace Tile? Building a fireplace frame with tiles might be a good option too. Most of the fireplaces use a wooden and bricked frame. 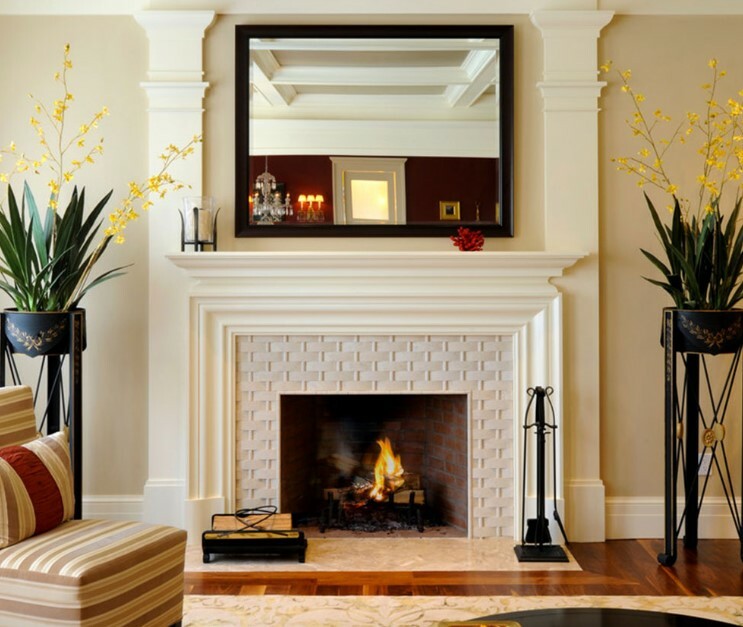 Hint: Having a tile frame or a combination of two different frame material can be a great choice for your fireplace. The pattern of the tile is crucial, it decides the feeling that’s about to be spread by the fireplace. In order to make the fireplace more impressive, the interesting tile pattern should be chosen. This abstract tile pattern would make a chic addition to your fireplace. 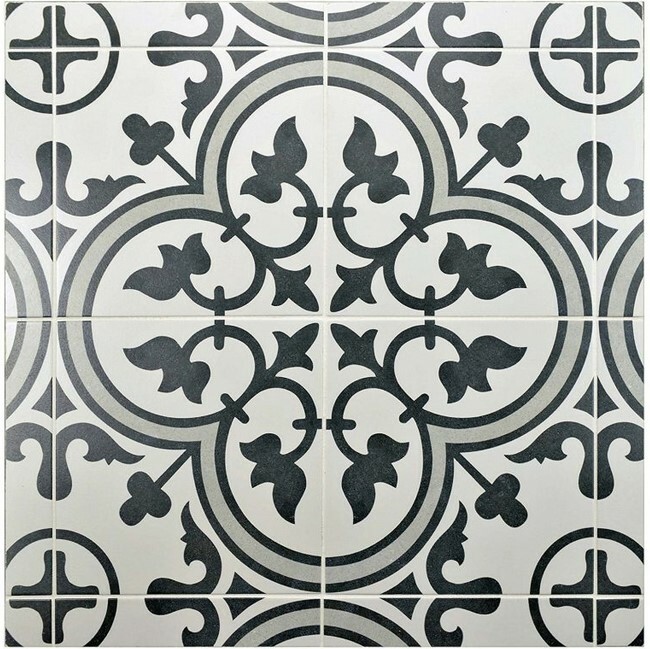 This tile can also be a vintage option you could install in your living room. You’ll never feel boring anymore when you combine the perfect colors together with the right accessories on the mantle of the fireplace. The beautiful choice of tile for a fireplace is this one. The glass tile is available in a multitude of styles and colors. You may want to choose this one if you have more budget for professional installation of this tile. Hint: It will be very difficult if you do it yourself, so hiring a professional is the best option you have. 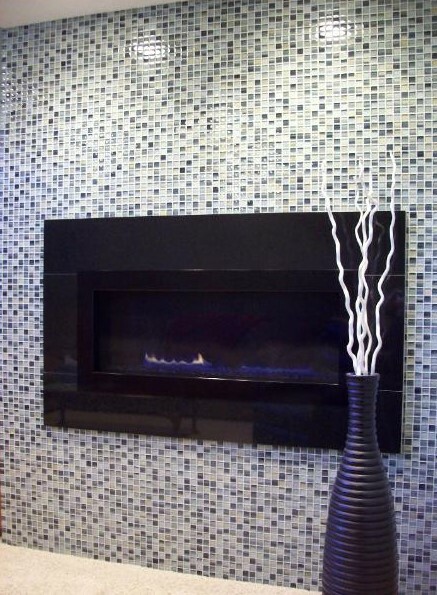 A mosaic glass tile can be a great surrounding for your fireplace. 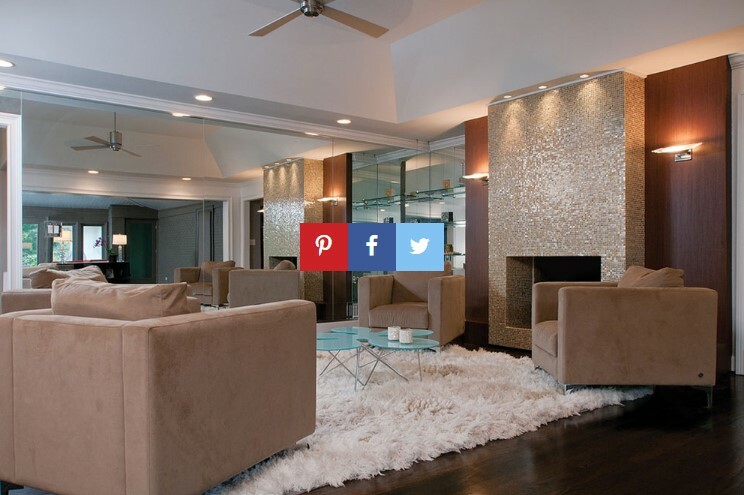 Especially, if you have a modern fireplace like the one in the photo. Hint: It’s gonna be perfect when the tiles are applied to the whole wall. It can be both wall and fireplace tile. Typically, this type of tile is made of clay. Ceramic tile comes in many forms. You can get various of styles from this type of tile. Whether it’s subway style or decorative mosaics style, ceramic tile is available for any fireplace style. Hint: This one is perfect material for DIY projects if you are considering to renovate the fireplace on your own. This hand-painted terra cotta style would give an alluring accent to your black-white living room. 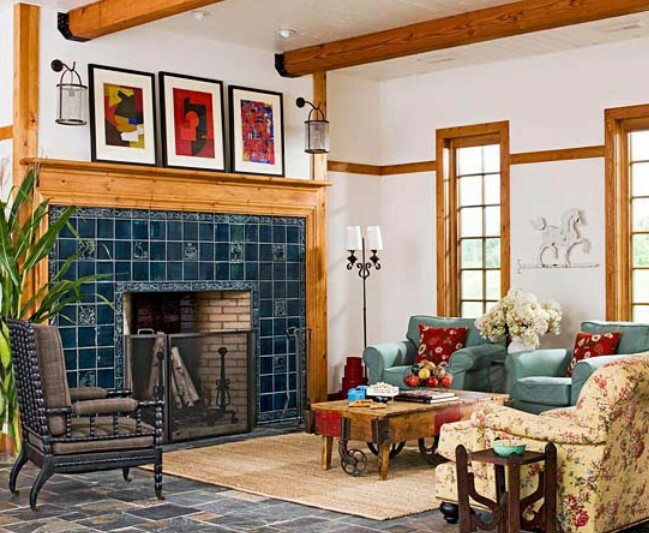 If you like the living room to enlighten with white walls and furniture, this terra-cotta tiles can be the perfect accent in your fireplace tile ideas. This material is usually used as the countertop. You can actually use it for your fireplace. The marble tiles are well-known for its durability. A fireplace with marble tiles looks so perfect with a classic and antique style of living room. 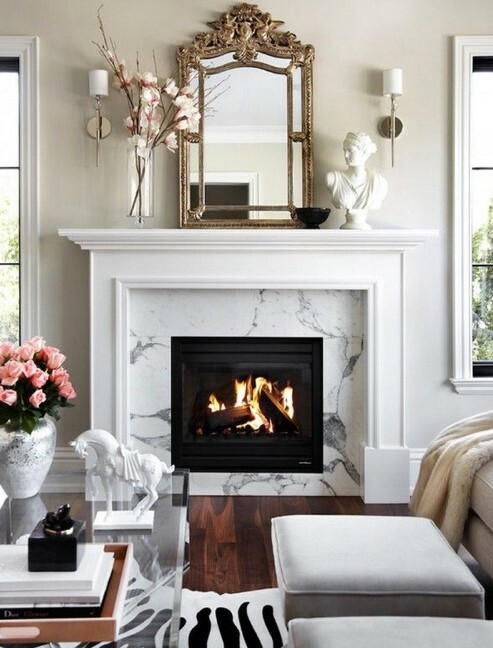 Having a classic sculpture and antique mirror on the mantle shelf makes a perfect connection to the style. This material is quite similar with ceramic. In general, porcelain tile is stronger than ceramic. They might come from the same material, which is clay. But, the porcelain has better clay. The clay in porcelain is more purified and refine. This is a unique choice of a fireplace design. The porcelain tile is in almost black colored. It seems to be the right color or tile considering the white wall. It contrasts so vividly together which makes the ceiling height and angled line get really highlighted. 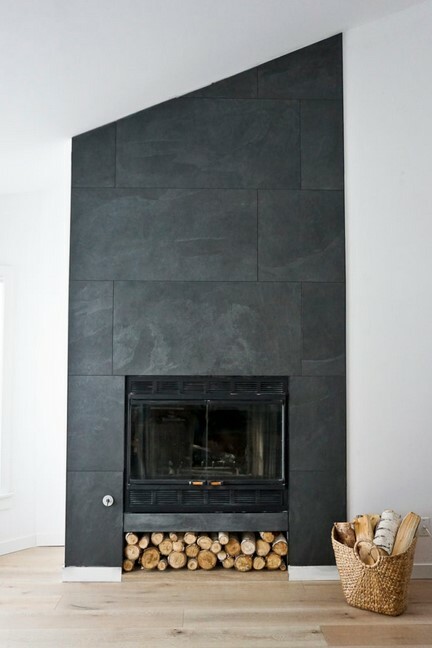 Similar to the gorgeous black fireplace, this fireplace has tile up to the ceiling. It creates a large and alluring fireplace design that really make a statement to the living room. 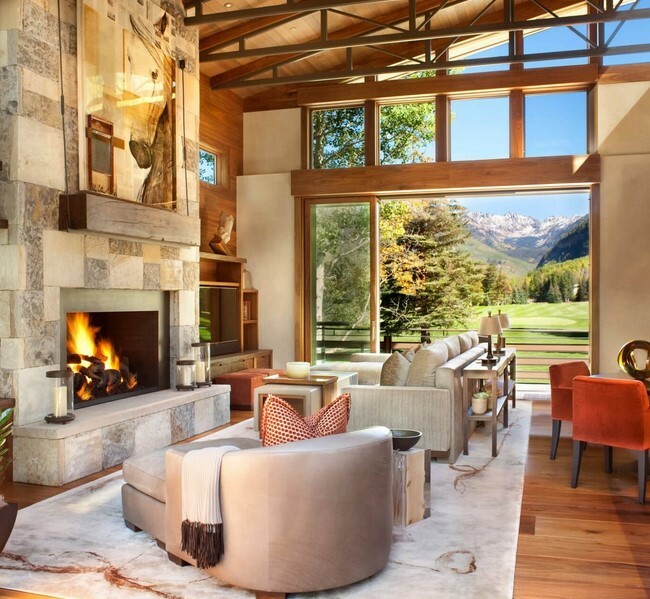 An open huge window side by side the fireplace offers a beautiful stunning view of the outside world. It does give the cohesive look to space. Hint: You can opt to have this kind of fireplace ideas to make a statement to your space and it wouldn’t make the room looks too busy. This is the pattern that is usually used for floor tilings and road pavement. It’s also trending to be the option of the tile design for fireplace surroundings. Hint: It’s called Herring because it is a fancied resemblance to the fish bones of Herring. Another nice choice of tile design for a fireplace, this is the right choice for your living room with rustic or vintage style. 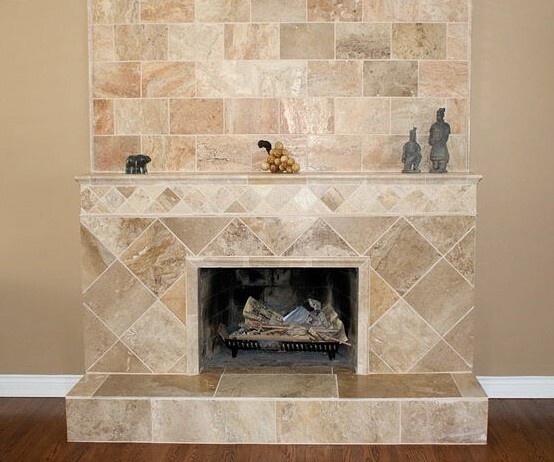 The material that offers aged character into your fireplace is travertine. 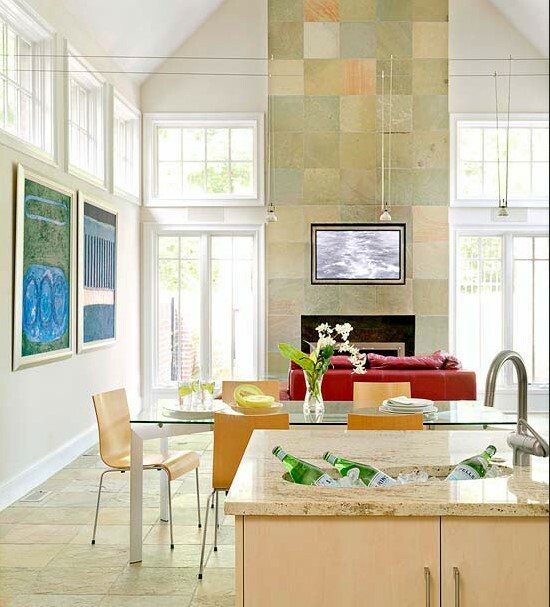 Travertine is mostly used for vintage style, but you can also apply it in a contemporary or modern room. If you wanna save your budget in buying travertine stones, you can always get tiles with travertine design. It gives the same look of travertine but with different materials. The real travertine stone would be quite hard to be cleaned, it’s only for rustic style of a room. Hint: If you are not comfortable with the rustic style, the travertine pattern of tile is the right choice. 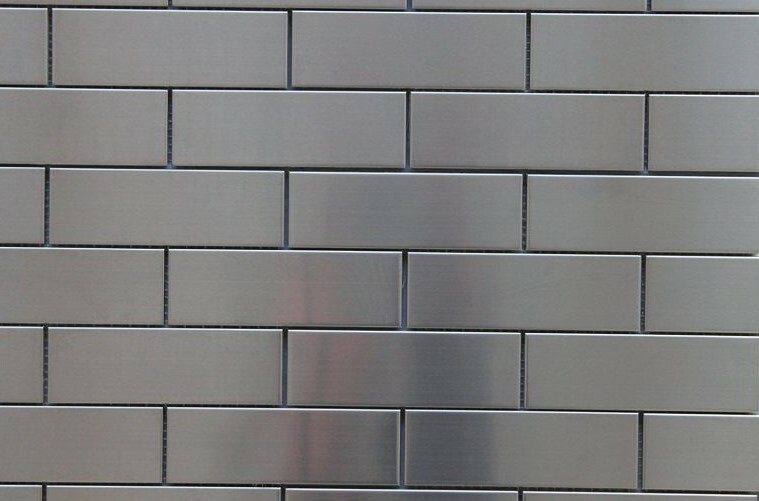 This is well-known as one of the strongest tile materials. It’s also the one that can resist heat in a high scale. One other pleasing feature is these granite tiles are scratch-proof and so durable. One of the reasons people love this tile is its ease to clean. 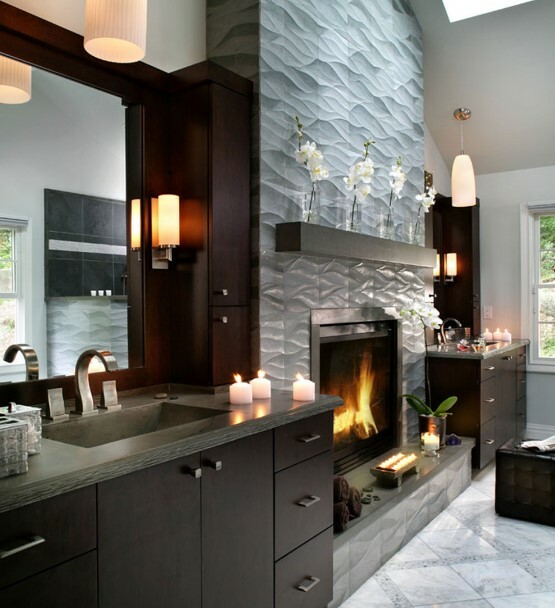 The luxurious looking of a fireplace is only provided by this granite tile. It happens to be in luxurious antique style for your fireplace. The price of Granite might be a bit expensive but imagine the premium quality material you will get for your beautiful living room. 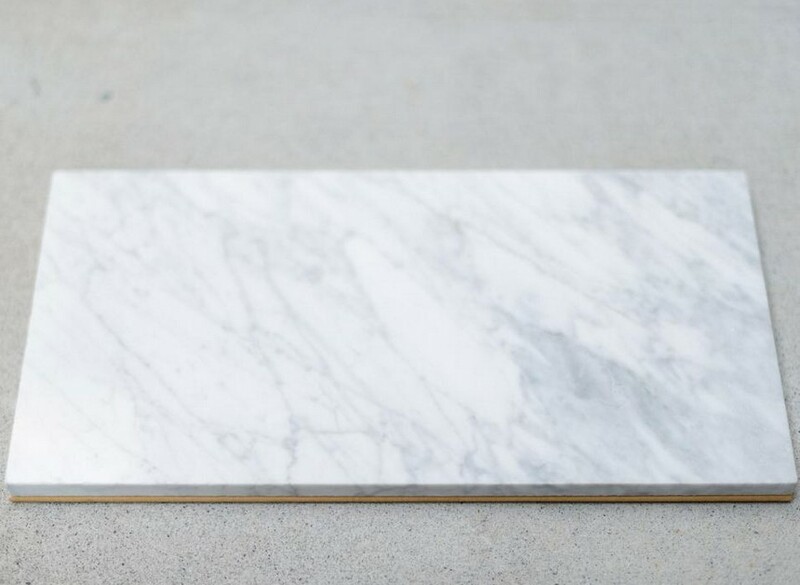 If you like marble tiles, this one is the better option. It has various design to match you style. The premium quality, comes with reasonable price which is pretty expensive. 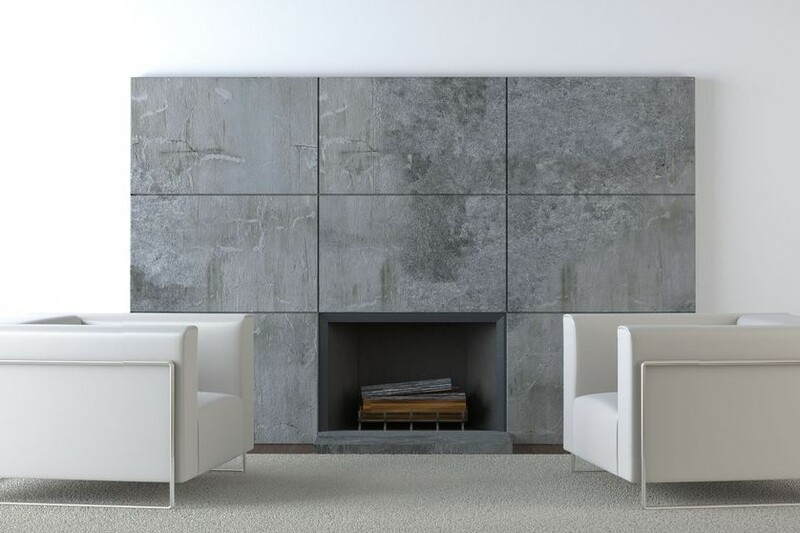 The pebble texture which is made up of a bunch round-bodied pebbles offers you unique, natural and 3-dimensional option for your fireplace design. There are some tile designs that have that kind of pattern. 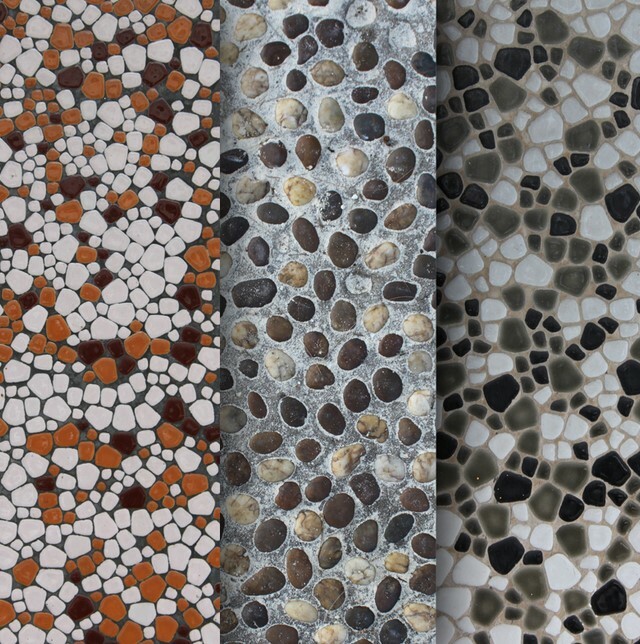 Hint: The tile with pebble texture will give the same option but with various designs and less expensive price. 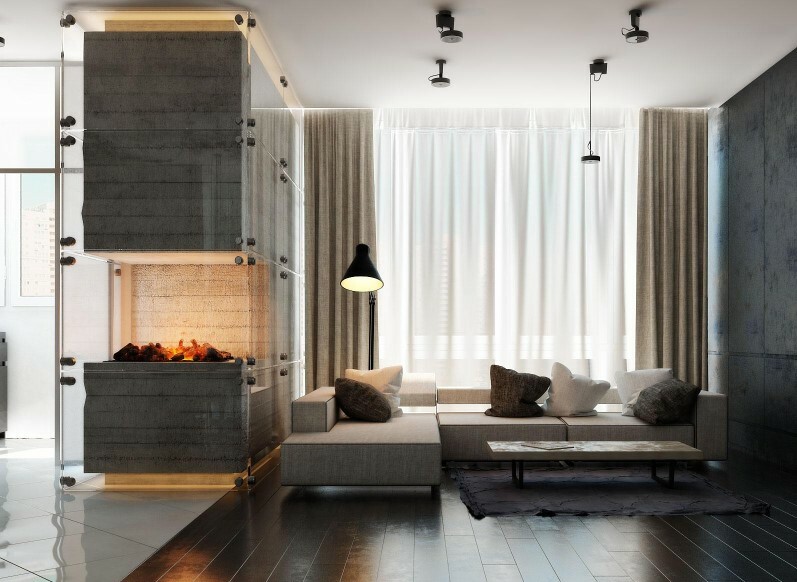 This fireplace design is a combination of rustic and simply chic style. It has a simple mantle with the accessories arrangement that offers chic accent. Then, there’s Pebble textured fireplace surrounding that suddenly becomes the point of attention. It matches the brown floorings though. 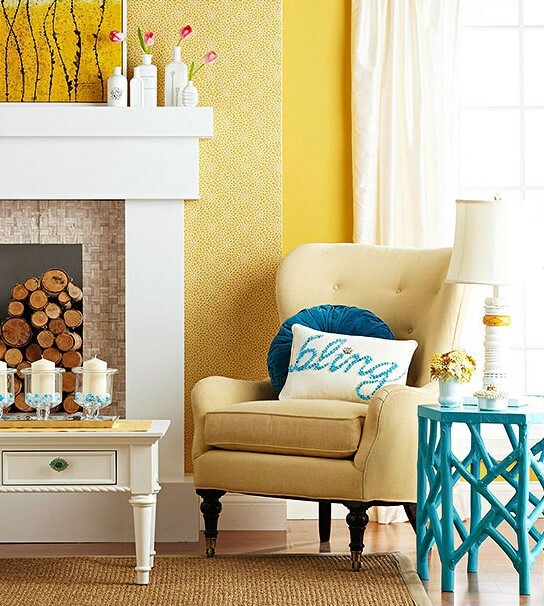 Mosaic art is a great choice for your fireplace. 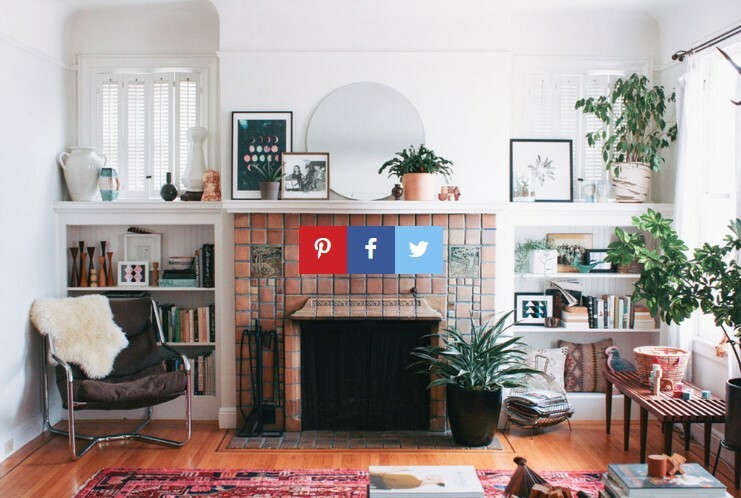 If you have an artistic skill, you might be able to do a DIY project for this fireplace. You can develop mosaic designs by playing with tile in different arrangements. Hint: If you do not have time arranging the small tile piece by piece, you can buy the ceramic or porcelain tile with a mosaic pattern. 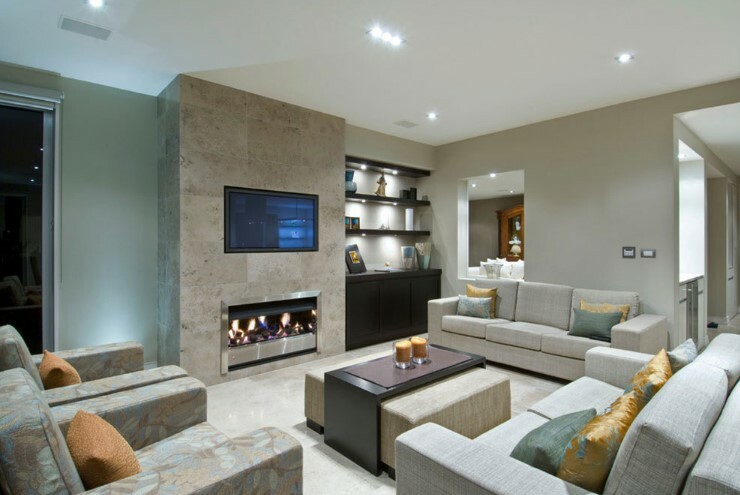 Choosing natural stone as the tile for your fireplace will be a high-quality option for you. 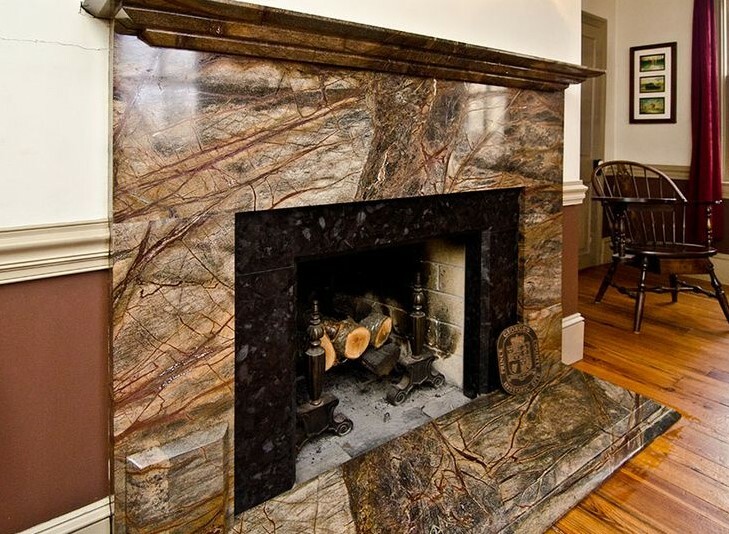 If you have a proper budget for having natural stones around your fireplace, this is a perfect choice you could have. 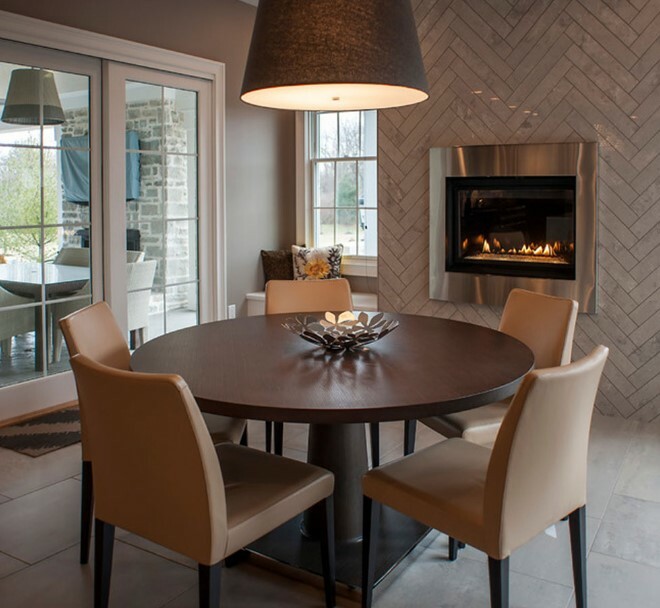 If you are looking for the best tile for your fireplace, this is the one. Natal stone is available in such alluring and durable materials such as travertine, limestone, granite, and marble which some are already mentioned above. Hint: As said before, natural stone has the best durability compared to other possible material. There is a uniqueness in any kind of natural stone tile, such a perfect choice for rustic or contemporary style. This is the affordable option you can have instead of natural stone. Some people want to save their budget on renovating or building the fireplace, they just want to make the fireplace looks amazing with affordable price. Besides a great deal, it’s also easy to install. Hint: Marble is one of the popular engineered stone options which have drawbacks including dulling and chipping of the sheen. This is an alternative material which is made by Mother Nature herself. You can make concrete into tiles which will look just like stone. Even, you can make it looks like wood by using special mold and colorant, the wood would be in realistic texture. Hint: This is a more affordable option compared to natural and engineered stone. Concrete tile offers many different looks. You can make it match in many styles from contemporary to rustic or even ultra modern style. This kind of material is quite easy to take care of too. 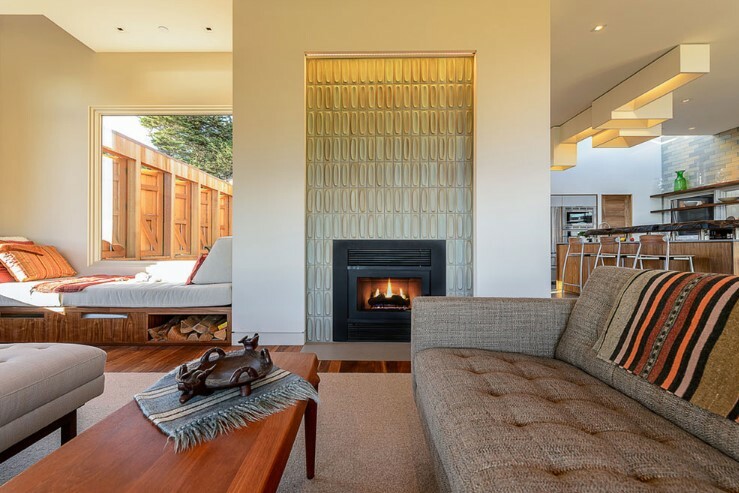 If you want to walk against the flow in choosing material for your fireplace tile, you may wanna check out metal tiles. There’s fireplace tile which is made from stainless steel, copper, and aluminum. This material can handle the head, it’s also used to adorn the fireplace surround. 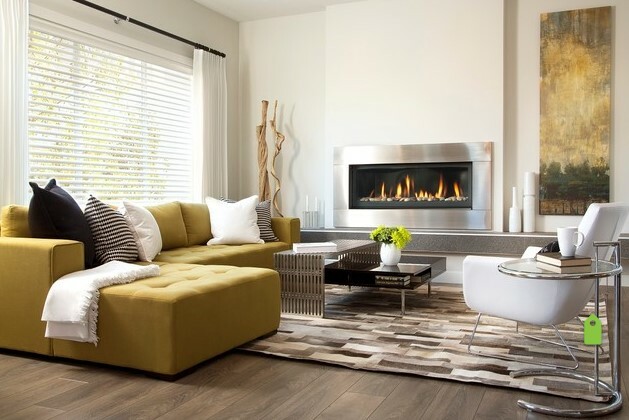 Having a metal frame for your fireplace is flawless for modern style living room. Hint: Even the simple stainless frame make a dazzling accent to the living room. With a smaller textured tile, you can create a border on the outside and inside edge of the fireplace surround. Hint: As you can see in the photo, the textured tile really stand out the border. On some of the larger tiles, there is similar texture which ties it together and adds interest. Relating to home design, neutral beauty means simple decoration with a monochromatic color scheme. Hint: It will give a contemporary style to your fireplace design. As you can see in the photo, it’s nothing but beauty. 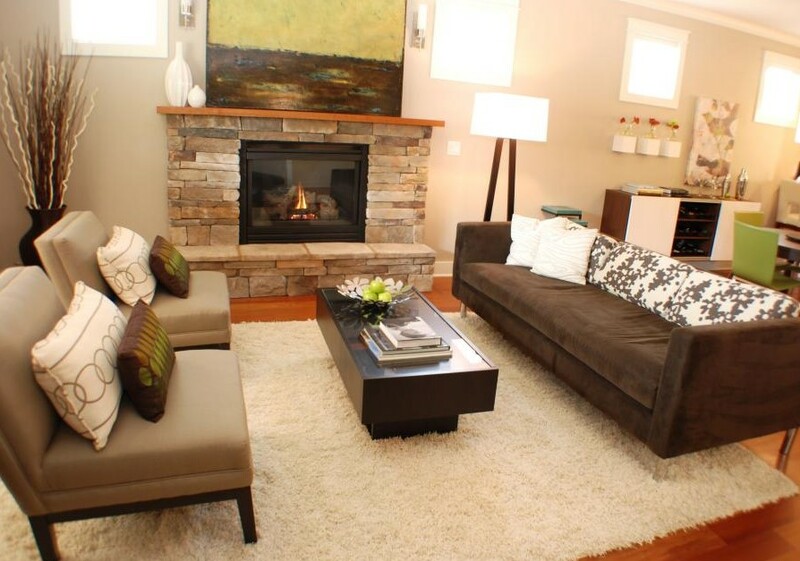 Having a natural feel of wood as the surround of your fireplace would bring the warm feelings into space. You can apply wood-tone tiles for that. 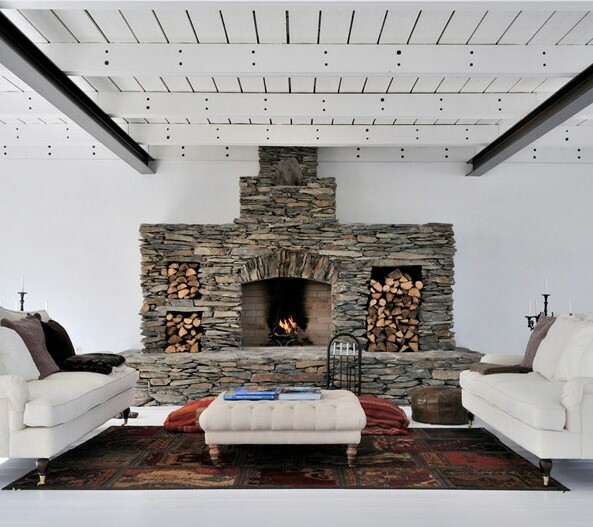 Stacked logs can be placed inside the fireplace to be an impressive accessory for emphasizing the look. Hint: If you think it’s a bit rustic, don’t worry a white mantle is there to keep it balance with modern style. 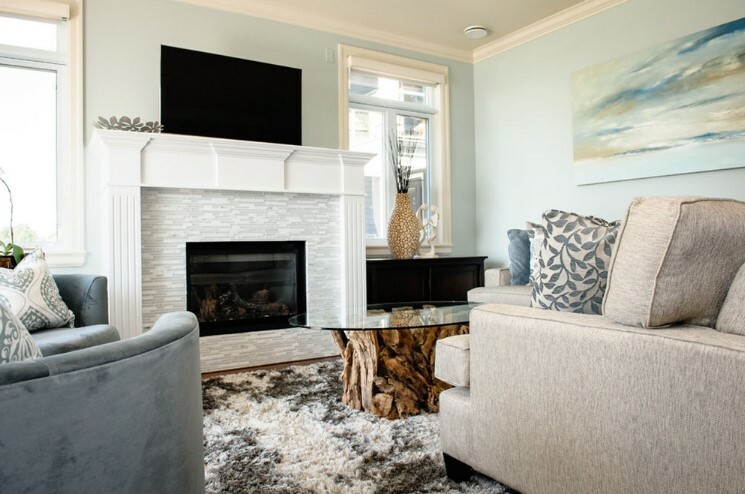 In order to build or renovate your fireplace, you will need to consider a lot of things before choosing the best one for you. The fireplace design has to be based on the size of the space and its style. You also need to consider about the quality of the materials and the budget you have. 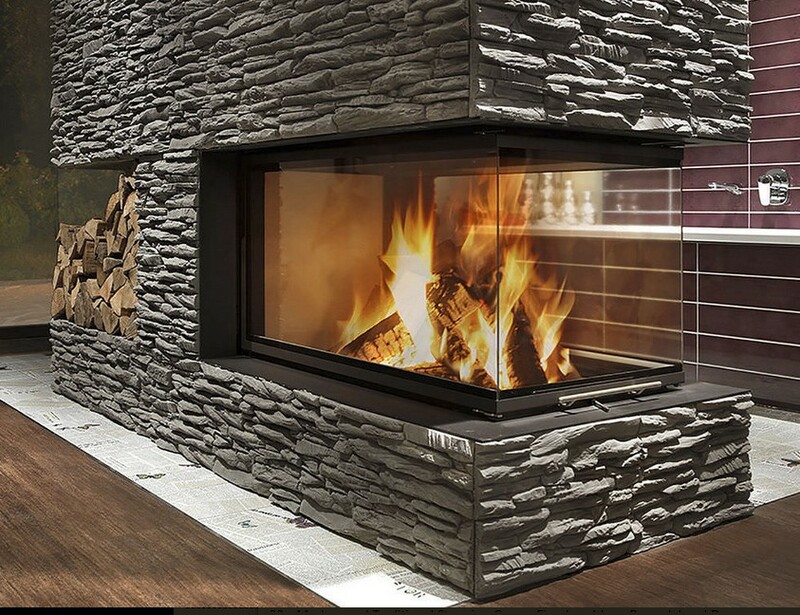 It all decides what kind of fireplace design you can have. Choosing the best fireplace tile ideas might be quite tricky. If you are looking for quality, you have to be ready to spend a lot of money for it but you will get a quality for a lifetime. If your budget is limited, there’s a bunch of alternative options available for you.